Getting your teeth straightened isn’t just about getting some sort of braces. Usually, it is more complex than “crooked “teeth. The treatment progress in a few stages. Orthopaedic treatment is usually the first step of “ortho” treatment. It concentrates on realignment or development of jaw, craniofacial bones, and muscle system both in children and adults. In some cases, orthopaedic treatment can eliminate the need for orthodontic treatment (braces). The reason behind this is that teeth erupt and align themselves in the space available to them. They exist in a least resistant neutral zone between lips, tongue, and cheeks. The position of the teeth is the final result of the forces between these soft tissues. “Crooked” teeth have little to do with the teeth themselves, but simply the imbalance of forces that exert on them and their bone either from outside (lips & cheeks) or inside (tongue). 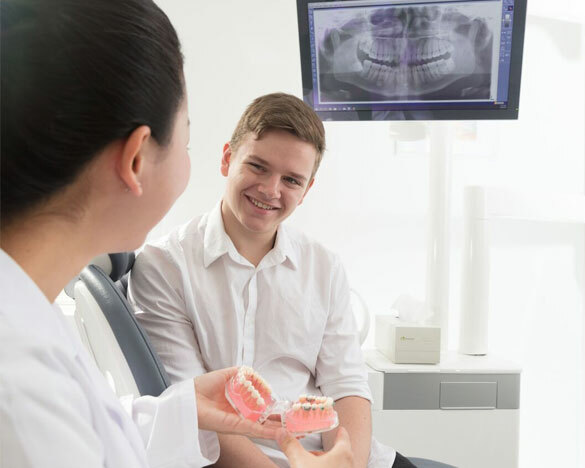 Therefore we need to diagnose and start treatment early to guide the growth of orofacial bones to their optimum potential and allow the permanent teeth to erupt into their correct position. In some cases, you may find you don’t even need braces, or the time of wearing braces is shortened. Studies have shown that 70% of children who undergo orthodontic treatment have misaligned jaws and derangement of jaw joint relationship. Misaligned jaw can cause head and neck pain and incorrect body posture. It is possible to go through life with a misaligned jaw with no symptom, but unfortunately some adults suffer chronic pains and end up having extensive orthopaedic treatment or jaw joint surgery. Guided growth minimises the effect of abnormal growth. Minimise or reduce the need for permanent teeth extractions. Improve nasal breathing and general health. Decrease or eliminate bad habit of thumb sucking, tongue thrusting. Make orthodontic treatment easier and shorter. Prevent headache and ear ache. Orthopaedic treatment may involve growth guidance appliances to develop upper and lower jaw bones to their genetic potential; jaw positioning appliances which correct your upper and lower jaw in relation to each other (your bite); and my functional appliances which assist in correcting your bad habits in order to prevent potential causes of malocclusion. These appliances can be removable making them easier to clean; at times they can be fixed to increase compliance. The type of treatment and appliances will be determined by our thorough examination. It’s important to talk to our 360° Dental Care team to plan and design a great future smile for you.